This is a project (hereinafter referred to as “ the project”) that Tomozo ak a Tomoko Kevorkian who handles the art work of Body&SOUL Kaito aka Hiroshi Wat anabe and VJ HAJIME produce an art DVD by their collaboration. The contents of the project are as follows. Thank you very much for taking an interest in this project. I am VJ HAJIME. I and Tomozo aka Tomoko Kevorkian who is a painting artist, collaborated for t he first time at the party of “deepspace Tokyo tour” thrown by DJ FRANCOIS K. I have been joining the party as a VJ since 7 years ago and the collaboration was conducted by goodwill from DJ Francois K and cooperation from Ryo Watanabe who is a promotor of DJ Francois K.
When I and Tomozo collaborated continuously at deepspace, the idea was emerged to create an artwork DVD which uses her artwork from Japanese distribution la bel of WAVE MUSIC at that time. So, we created a MIX CD from some resource that was released from a certain la bel. But if we used the music resource for the DVD, we had to make a different contract so it became to be difficult to use the music for the DVD due to fin ancial issue. Then, the DVD was once completed but the activity of the label itself stopped and the DVD never released. So, this time we will reproduce DVD that we could not release before, by updat ing her artwork. We will utilize cloud funding to create the DVD so we would l ike to ask your cooperation and donation. Kaito aka Hiroshi Watanabe belongs to Kompakt that is one of the largest electronic labels in German and he is an only Japanese art ist of the label. He will handle the music of the project from the recommendat ion of FRANCOIS and Ryo Watanabe. He is also an originator and world-class art ist The money from your support will be used for the music resource and publicatio n charge for internet. Besides, Mr. Teruyuki Kobayashi and Niiyan who supported deepspace Tokyo tour, and Ms. Megumi Wakatsuki who is a translator for this message to the world wi ll work together for this project. Plus, the follow up and planning and manage ment is provided by diskunion. We would like to try our best to create the DVD and please enjoy it. Thank you very much. The flow of the story to collaborate the artwork of Tomozo and VJ till now. I have been believing that I have an ability of drawing ever since I had been admired of my drawing from the principal of a kindergarten when I was a child. I wished to be an illustrator or a comic artist in my teenage years. When I w as absorbed in my play with palette knife and paints on the paper as if I was a child, and my touch was born at that time. Then, like a 3D dimension was born from a pigment and then I felt there were m any stories in it. The paper was supposed to be a trash but when my husband ca me back home and he was amazed to see it. Then he told me that he wanted to ha ve it if I throw away it. After that my husband recommend to experiment more so I began to draw hundreds of paintings. In the meanwhile, it became to be my therapy. I just make a mot ion with my hand innocently without any purpose. There is a word “Every drawi ng is a performance and ritual.” by Keith Haring. Like this word, I just give out my emotion and energy that moment. As I was absorbed in drawing, I became an instrument of the gods of art. So, I decided to enjoy the condition, which the gods make me draw like that as much as I can. Only the gods know the time when I stop. When I gaze at what I created after f inishing painting, I could see a variety of landscapes, dancers, movements and faces. And I feel it is really interesting that different people have differe nt look when they see my creations. For example, one Germany friend feels like seeing a German actor in my drawing. Take one more instance, when I see my cr eation, I feel like looking inside of the body in my drawing, but the other fe el like seeing the woods in the same drawing. Somebody say my painting seems t o be alive. So, if soul lives inside of my creations, there's nothing that cou ld make me happier than this. I also would be so happy if you just feel and po re my creations. She is widely known as her artwork of Body&SOUL, and the art work is used for the logo, album, cover, flyer and T-shits and so on of Body&SOUL. She has been playing an active role as a free-lance stylist and illustrator since 80’s. She was inspired from underground culture and pop art scene in NY so she moved to there. Then, she married Francois Kevorkian in 1991. She has been handling of the artwork of Body&SOUL as a staff since 1997. 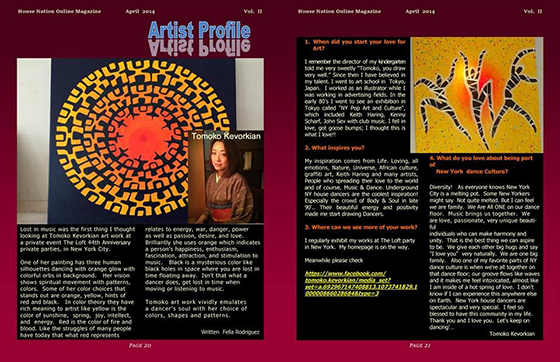 Since then, she has been providing her art work to the scene as a staff of Underground House Heads. Her art work is displayed at The Loft of David Mancuso 3 times in a year. She continues to collaborate with VJ HAJIME at Club Yellow, eleven and Francois K./Deep Space. Lately, she deployed VJ collaboration at Body&Soul@American Museum of Natural History and provided her art to New York Dance Parade/ House Coalition. She is also creating variety style of art such as dynamic dancers in NY, cosmically abstract painting and BATIK ART and so on. He releases his music under name of Kaito as a solely Japanese artist of Kompa kt that is one of the largest electronic labels in German and he also gets pub lished his music from Klik Records in Greek. 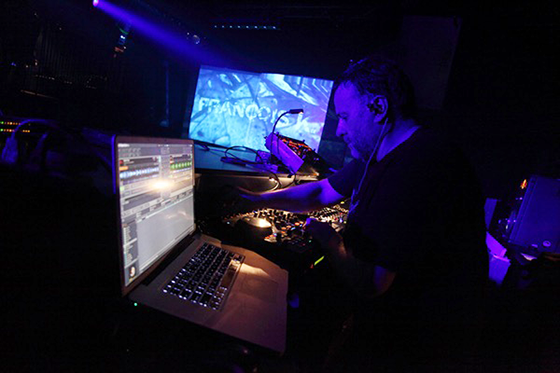 “Intension” that is included in his 1st album of “Special Life” created in 2002 is packed the mix CD of Francois K. So, the music has major repercussion s 10 years ago and the music passes down to the generation as an ageless song by enduring attraction. Then, he released 2nd album of “Hundred Million Light Years”. This album inc ludes the title song that was packed in the compilation album of Kompakt. Thes e 2 albums made his name become world-famous so he conducted live at the big e vent such as Sonar Festival in Barcelona. Beatless album that is pair up sound all the time was created in his original album of the under name of Kaito and the sensitive and beautiful melody is app eal to wide range of music fans. “Trust Less” is packed in 3rd album of “Tr ust” and includes more acoustic elements and so this song is more like listen ing music. 1st album of “Genesis” that is under his real name Hiroshi Watana be recorded his best sales and then he released “Sync Positive” in 2011. As the title indicates, the album makes listeners joy. Also, he spawns a new field of lyrical sound mix with melancholic visual and s ound in the collaboration album “Life, Love” with Mr. Keiichi Sogabe with wh om he deepen exchanges through remix. In the meanwhile, he gets a lot of attention by downtempo project “Trend” wi th Mr. Takehiko Kitahara who is a graphic designer. They met when they lived i n NY. Then, they superbly established particular balance of the overtone which is simple, soft and mixed by dry beat. And the sound goes beyond the genre of House, Techno and Hip-hop music. The 5 limited edition album and 4 EP are kno wn as inalterable value music. In 2013, he released 2 albums. One is double DJ mix “Recontact “ that was pr oduced for 20th anniversary of Kompakt and the other one is “Until the End of Time” by under the name of Kaito for the first time for 4 years. These descr ibe new Kaito by the magnificent sound scape. In 2016, EP “Multiverse” is determined to release from Detroit label “Trasm at” that have been building a great trajectory in Techno music history. From an artistic view of the leader Derrick May, so only extremely high grade music could be released and the music was succeed to release through this situation. The music is like galaxy because the sound bounds in gleam richly universe. And other album that is the same name as EP will be released in April. Hiroshi Watanabe is a man who produces his music to the world based on from many labe ls that have been creating music history. He is a gifted musician who keeps wa lking to where no one has gone before as a Japanese. He is highly evaluated his VJ style by many legend DJs and producers. Because he expresses the sound beautifully in a visual way, based on his own plenty mu sical experiences and visual skills. He has been joining “deepspace” by FRANCOIS K Tokyo tour and “TIME WARP” b y ALEX FROM TOKYO as a regular VJ over a period of years and also he joins as a VJ frequently when Louie Vega of Masters at Work, Timmy Regisford, DJSPINNA and DAVID MORALES, when they visit Japan. Besides, he handles Louie Vega’s world tour visual for years now and joined n ewly opened club “CICADA” in Beijing, China. Like that, his global activity is increasing now. Needless to say but his VJ style is beyond the genre and based on old and new HOUSE music, he is also evaluated as a rare VJ who can express Old School soun d by Jeff Mills. He is not only Party VJ but also he produces promotion movies of Body&SOUL, Cl ub YELLOW, King Street Sounds, club eleven, DVD of Timmy Regisford and other p romotion music movies. He has been engaged in many parties as a VJ with Big Artist such as DAVID MORA LES、LIL LOUIS、KENNY DOPE、DANNY KRIVIT、Ron Trent、Chez Damier、Ame、Quentin Harris、Tony Humpries、DJ SPEN、KARIZMA、Todd Terry、Robert Owens、Mr V、Pete Rock、Stephane Pompougnac、Kenny Larkin 、Vince Watson、Glimpse、A Guy Called Gerald、Daniel Bell and so on.